At some point in my life, karaoke has become a go to for every emotion. During this time of karaoke craziness I have learned there are two kind of karaoke people. Those who take karaoke WAY too seriously and those who give no fucks and just want to have fun. Yet even with those two extremes, personally I believe that every die heart karaoke queen (or king) has the same basic pattern when choosing the perfect karaoke songs. No matter how “bad” a singer you are, we all have that one song or artist that we can feel pretty comfortable doing as a karaoke song. For me that is Pat Benatar. It is a scientifically proven fact that if it is a karaoke night I will start the night with one of her songs. Why.. because I like to think I live in the 80’s and because she has a similar vocal range. 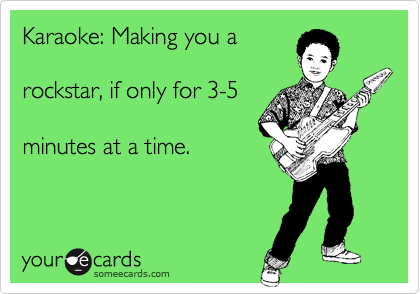 After 3 years of doing karaoke at a sports bar I have learned that this can change weekly. Depending on the age of the crowd that is there. (or if you are at a sports bar it can depend on if the home team won or lost). But of course there are some never fail songs.. ” Don’t stop believing” , Any Boy Band or Pop star from the 90’s, or ” Pour Some Sugar on Me.” have always proven to be instant crowd favorites. Basically anything that at least 80 percent of the people in the bar can sing along with is usually a good starting point. Every group of girls who goes to karaoke has this song. It is the one song that you don’t really sing as much as you can just say all the words. (or if you have had enough to drink you- just yell the chorus because it is the only part you know) But it doesn’t matter because you are just here to have fun. These are the songs you’ll hear at about an hour an a half before closing time. No matter what you tell yourself, you sound terrible. Worst part is, deep down you know you sound terrible. But you sing these songs no matter what. And everyone else is also drunk so really there isn’t anyone who is going to stop you. When those words come out of my mouth you know it is time to take the sign up pen away from me and hand me a water.